Drawing on his scientific understanding of the brain, noted neurosurgeon and lifelong horseman Allan Hamilton offers a new approach to horse training based on understanding the intuitive, nonverbal, right-brain communication process of horses. Combining brain science, horse sense, and fine storytelling, this spiritual handbook points toward a special and completely real form of enlightenment. 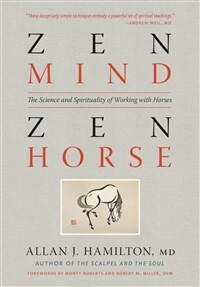 Zen Mind, Zen Horse is far more than a book about how to care for a horse, though it stands out as one of the best on the subject. Rather, Hamilton has given humans a way to achieve our highest good by allowing horses to be our guides. This beautiful testament to the power and magic of equine energy captures the soul of a horse perfectly. Zen Mind, Zen Horse is both practical and profound, offering sound advice for tapping the wisdom of horses as natural mindfulness teachers. These deceptively simple techniques embody a powerful set of spiritual techniques. Allan J. Hamilton, MD, is a Harvard-trained brain surgeon, a renowned horse trainer, a developer of equine-assisted learning programs, and the author of Lead with Your Heart and Zen Mind, Zen Horse (Gold Nautilus Award winner). He is a professor of neurosurgery at the University of Arizona and a medical script consultant for the hit television series Grey’s Anatomy. He raises Lipizzan horses on a small ranch on the outskirts of Tucson, Arizona.